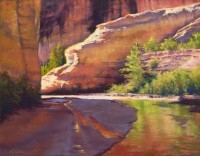 "The landscape of the American Southwest captivates my interest by providing endless sources of majestic painting subjects. I enjoy the quiet beauty of time alone in the wild places still untouched by the modern world. It is here in the stillness of nature that I have the multi-sensory experience of what I call "moments of profound beauty" a sense of expanded awareness and opening to inspiration. Then capturing this moment through painting allows me to experience my own vastness and express it to the viewer. The result of which is an invitation to enter this quiet untouched world and feel ones own vastness." 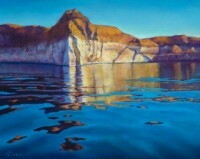 Internationally and nationally awarded Colorado artist who grew up in California with the influence of an artistic family, Marjie’s academic studies majored in fine art and graphic design. Her first career was as a Graphic Designer and Art Director for an International Corporation Headquarters in San Francisco, where she specialized in the design of speaker support presentations. Upon leaving the corporate environment she continued her work in fine arts, freelance graphic design and illustration, while pursuing her interests in being of service in the healing arts where she came to develop her workshop series "Your Creative Journey - Through Pastel". 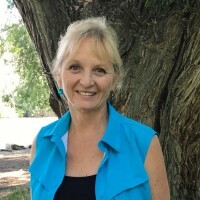 She has incorporated her Life and Creativity Coaching with her more than 25 years of experience of painting in Oils and Pastels to guide and inspire others in their artistic interests. 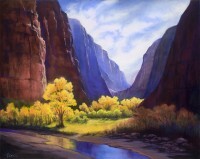 Marjie’s paintings convey vivid contrast and interplay of intense color, capturing dramatic light and shadow. 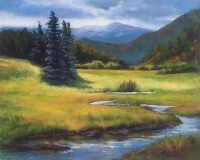 She is best known for her colorful paintings, often with elements of water and reflection from Southwestern and Rocky Mountain region landscapes.